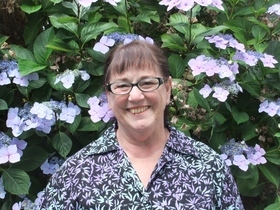 In this Scottie Profile, Scottie's News talked to Joanne Querin-Sorenson, McDonald International School Kitchen Manager. Scottie’s News snuck in between meals to ask her a few questions. If you’ve met Joanne, you already adore her as much as the students. What you may not know is that she has degrees in speech pathology and veterinary medicine, she worked at lots of newspapers and … well she’s just plain fascinating. Scottie’s News dug beyond the apple slices and milk boxes in the lunchroom and found out more interesting tidbits about her life. SN: Do you live right around here in the McDonald International School neighborhood? JQS: I live close to Green Lake and a friend of mine and I have been able to enjoy this great weather of the past 4 months to ride around the lake, nearly daily--my friend on her bicycle and me on my tricycle. SN: Beautiful Park for sure. We're glad you get out there and enjoy it. SN loves to sniff trees, get muddy and maybe roll in something nice and stinky down there. Any other fun activities around the 'hood? JQS: A fun experience was one day I dropped into the Mighty-O doughnut shop and 6 or more McD kids were there and they were so excited to see me. One of the parents came up to me and said, "I thought you were a celebrity!" SN: Well, being instantly recognizable to several hundred humans, even small ones, does actually count as celebrity, I think. I hear you're interested in MIghty-O's composting projects too. It's nice to know that you're thinking about that stuff in the kitchen. Sounds like you have some roots in the area then? JQS: Yes, I am fortunate to have lots of family and friends close by. So, many opportunities to celebrate. SN: We've heard you've done some big time roving, how did you circle back to our little Scottie corner of the world? JQS: After my husband died, I saw an ad in the Ballard community paper that subs were needed for the kitchens in the Seattle Schools. I applied and two years later I "fell" into the permanent position for McDonald International School. At that time we were at the Lincoln Building. I am so extremely fortunate to have been able to connect with McDonald International School. I LOVE my job. SN: How awesome that community newspapers still help people find jobs (please let me continue to believe it was actual ink on actual paper. Believe me it's no fun running out on to the lawn to retrieve a blog.) So there's this rumor out there that you're quite the sailor. As in moving around on sailing boats. SN: That's mind blowing in its own right. Stand alone mind blowing. But it seems like the rumors mentioned penguins. Which my Scottie sense tells me could take some time to explain. Go! JQS: Then in 1989/1990 I met the same boat (The Betelgeuse) in Buenos Aires. Three of us prepped the boat in a town called San Fernando which is an hour or so north of Buenos Aires in Argentina and then we sailed it down the Rio Platte to the Atlantic and then down the Atlantic coast, thru the Beagle Channel to Ushuaia and after a couple of weeks of exploring around Ushuaia, we then sailed around the Horn and then thru the Straits of Magellan and I left the boat in Chiloe/Puerto Montt, Chili. We spent 5 months in this endeavor. The people we met and the places we saw were wondrous. Not many people do sailing trips in this part of the world. There's lots of sailing there, but not necessarily going around the horn. At our time there were 3 French boats, 1 German boat, 1 Dutch boat and us. SN: Mind blown again, Joanne. Some Scotties, in particular our spanish immersion kids, might be interested in how you communicated with the locals. JQS:The mariner’s language is English so whenever we were in contact with the lighthouse keepers or other maritime authorities, English was what was spoken. And, all the people from the European countries were fluent in English. For this reason, I am so delighted that many of Seattle's kids are in immersion programs. So important that we know more than one language. SN: Still wondering about the penguin thing. JQS: The mountain-to-sea glaciers, the incredible night skies, the "little" ice bergs in the straits, seeing the cliff drawings of the artists from Darwin's/Fitzroy's Beagle in Puerto Deseado, Argentina, hundreds of penguins and seals and small whales following the boat were only a few of the breathtaking marvels in that part of the world. The penguins walking along the shores was truly an amazing site I could not tire of. The people who live in the southern part of South America are extremely hardy. We were there in the summer and even then the winds can get very strong....a constant wind chill. SN: Thanks for chatting, Joanne. Hope that you don't feel the lure of the ocean some random day before lunch service and just sail away. We're all glad you're here. We know that you've built a lot of trust and good friendships with students at McDonald International School. Word in the hallway is that if you need a hug or a high five, Miss Joanne probably has some to spare. Thanks to you, Scotties are both well-fed and well-hugged throughout the day. Folks may want to drop you a line to say thanks or just "hi" at joquerinsore@seattleschools.org.